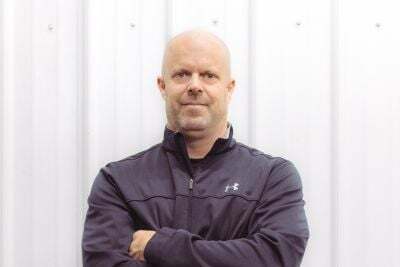 TerryTown RV is one of the top RV dealerships in Michigan, and in Grand Rapids! We have a huge inventory and super low prices, so we can make your RV dream come true! 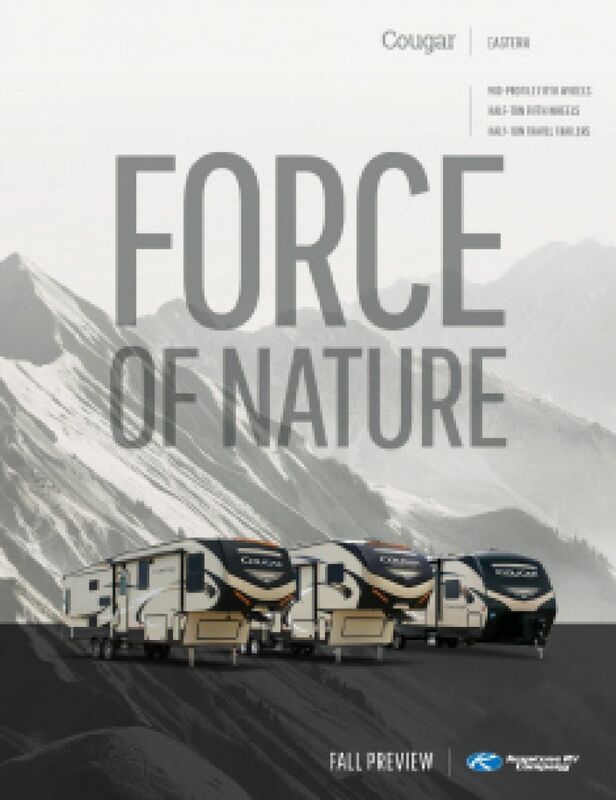 Whether you're in love with the 2019 Keystone Cougar Half Ton 29RKS 5th Wheel, or any other RV, we'll have it in our inventory! Head on down to 7145 Division Ave S Grand Rapids Michigan 49548 or give us a call at 616-455-5590 and let us make your RV dream come true! It's not hard to travel long distances with this RV, which has a hitch weight of 1605 lbs. and GVWR of 10400 lbs. You'll enjoy a nice, cool shade outside with the 20' 0" awning! This 5th Wheel has room for the whole family! It's 33' 7" long, 8' 0" wide, and has 3 slides to optimize the living area! And when the weather outside is inhospitable, the efficient 35000 BTU furnace and modern 15000 BTU a/c unit can keep the climate inside pitch perfect! After a full day of RV fun, nothing feels better than snuggling down into your own bed for a good night's sleep. This 5th Wheel is roomy enough to sleep 6 people! You can enjoy the spacious comfort of a Queen bed in the master bedroom. Cook up delicious meals with the family with the kitchen's 3 burner range cooktop. The 12.00 cu. ft. refrigerator provides plenty of space for your food, and the 60 gallon fresh water tank offers clean, drinkable water throughout the trip. 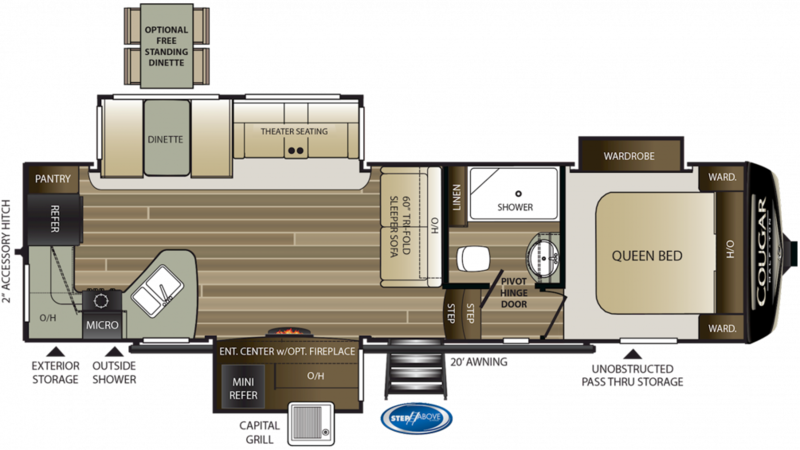 You'll love life on the road in this 5th Wheel, especially because it feels so much like home! A big part of that feeling comes from the full bathroom included in this RV. With its roomy shower and sanitary Foot Flush toilet, you'll enjoy comfort, convenience, and privacy! Nothing beats it! This RV has a 60 gallon gray water tank and a 30 gallon black water tank, so there won't be any bathroom-related issues on the road! If you're enjoying a great day outdoors, why let it end at mealtime? Just open up your outdoor kitchen and the fun keeps going! And you can eat outdoors, too, in the comfort and protection of the super 20' 0" patio awning that opens easily for your enjoyment!